Members from the Arkansas Economic Development Commission’s (AEDC) overseas Global Business Development team met with the World Trade Center Arkansas (WTCAR) officials in Rogers on Monday during their annual trip to the state. 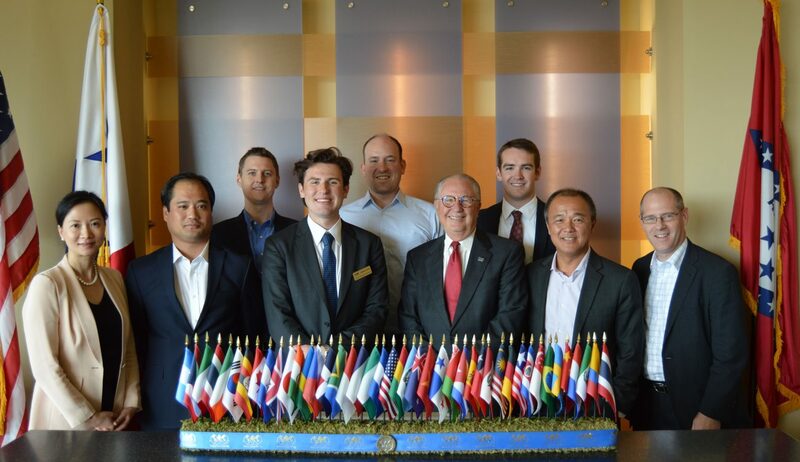 The group from the AEDC included director of international business development Mark Hamer and international project manager, Ben Walters, stationed in Little Rock, as well as Cornelius Schnitzler, Lindsay Liu and Neal Jansen who serve as directors of the AEDC offices in Europe, China and Japan respectively. During the visit the AEDC team and Boon Tan, Senior Director of Global Trade Strategy for the WTCAR held meetings with Tyson and Walmart. The AEDC team also met with local and state officials. The World Trade Center Arkansas serves as the export promotion arm of the Arkansas Economic Development Commission and WTCAR officials will often travel with the AEDC on missions to foreign countries and trade shows. The Center recently established offices at the AEDC in Little Rock to further strengthen the relationship and increase its reach throughout the state. The mission of the AEDC seeks to create economic opportunity by attracting higher-paying jobs, expanding and diversifying local economies in the state, increasing incomes and investment, and generating positive growth throughout Arkansas.